Well I have decided to challenge myself this year in order to work at my woodworking more and get my shop in order.. yeah, yeah I know I was suppose to be doing that as part of ShopQuest 2010. But, really I am going to do this this year, and to keep me on track I have decided to post a blog each week in order keep motivated. Some of the blogs may be posted as projects but more then likely not all of them. I have a few shop ideas I am planning to work on including a parts storage cabinet and a drill bit holder (which I am still trying to decide the best solution for that one) the big goal is to get my lathe up and running. Smaller projects will include toys, games and boxes, all of which I have recently grown quite fond of. I also need to finish a few more pieces of my office furniture so I can get that room under control. 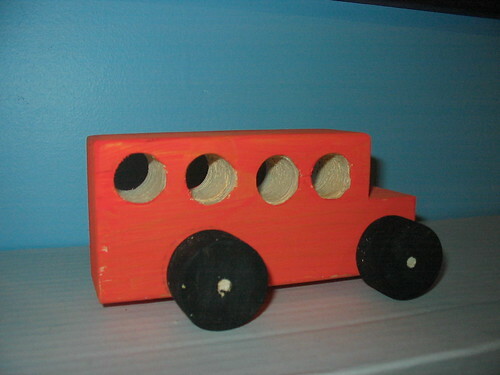 After making a simple school bus for my nephew my daughter decided she wanted one as well. She painted it and helped me with the putting on the wheels. She likes it a lot. 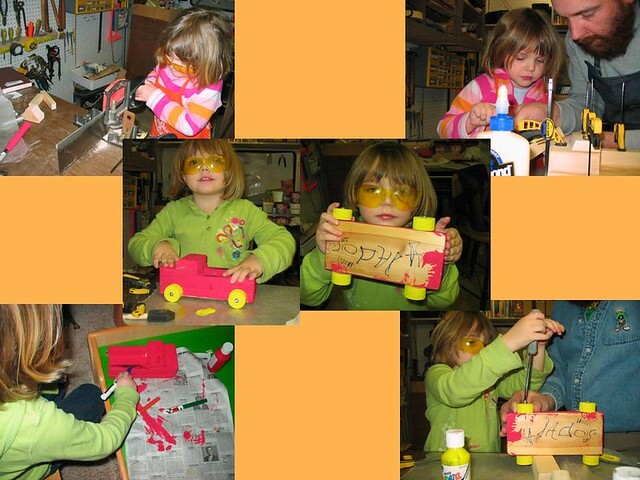 As we were working on it she saw a scrap material truck concept I built and told me she wanted one as well. We decided on making it a pick up truck style. I cut the scraps out and she helped with every step of the way. 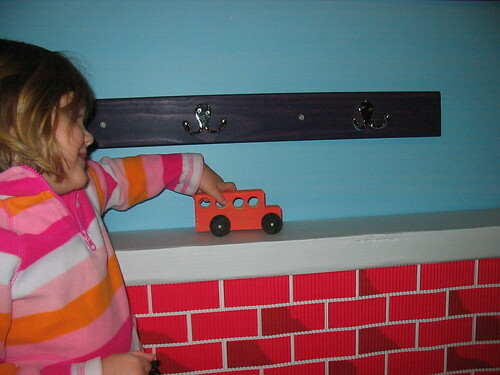 Even helped to saw the bed rails to length. The last project was a quick and dirty chisel rack I put together and happen to have some paint still sitting around from the wheels of the bus so I added a bit. 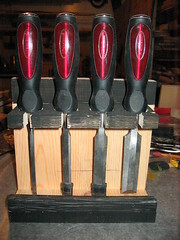 I am just happy to finally get my chisels out of the cubby hole they have been in for the past 2 years. Still have not decided as to how to mount it or if it is just going to sit. So there you have it my plans for the next 51 weeks and my start to the year. Let me know if any of you are planning to do something similiar I would love to follow along. Hope everyone has a prosperous and good new year. I want to spend more time woodworking also, best of luck to you.